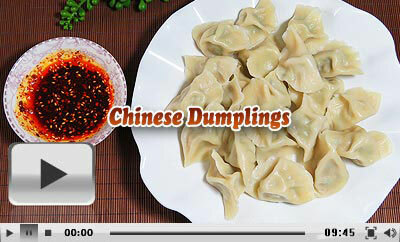 Characteristics: With a variety of fillings used, Chinese dumplings taste fresh and delicious. They are usually enjoyed with seasoning sauce or seasoning soup, which helps to improve the flavor. In northern China, the dumplings, Jiaozi in Chinese, are one of the most popular staple foods. Different from the ancient times when people only had dumplings on important festivals, they now eat whenever they want. But still, making and eating dumplings is an important activity for most families on the Eve of Chinese New Year. Family members gather together at a table, wrapping and eating dumplings while and enjoying the Spring Festival Gala. In addition, it is a tradition in northern China to eat dumplings on the day of Winter Solstice. Note: The amount of the ingredients listed above serves two to three people. Note: The amount of the seasonings listed above can be appropriately used according to one's personal taste. 1. Dispose of the skin of the pork. Clean and chop the pork. Add the five spices powder, soy sauce and cooking wine. Fully mix them and preserve for 15min. 2. Trim the celery and remove the big leaves. Clean the stems of the celery and chop into small pieces. 3. Peel the ginger and prepare green onion, then smash them. Making the Dough: Pour 400g flour into a basin. Repeatedly add water and stir to make all flour form small pieces. Add more water, gather the flour pieces and knead into dough. Cover it with preservative film to stand for 20-30min. After, knead it smooth enough and cover it again for later use. Making the Filling: Combine the chopped celery, ginger and green onion with the ground pork. Add salt, five spices powder and sesame oil and mix them all. Chinese Dumpling Wrapper Recipe: Cut a small section from the dough. Rub it into a long stick and cut into small dough balls. Flatten them all and roll flat to form round flour sheets. Making Dumplings: Put some filling in the center of a wrapper. Crimp it and press the edges. Clasp hands and pinch it hard. Make more in the same way. 1. Dumpling fillings vary a lot, ranging from all sorts of meat and vegetables to seafood, mushrooms and even fruit. For vegetables, lotus root, celery, leek, cabbage, mushroom, carrot, caraway and fennel can be used; meat like pork, fish, beef, mutton, chicken and shrimps can be fine choices. Meanwhile, vegetable fillings are also popular and the most popular one in China is made of leek and egg. 2. The shapes of dumplings can be different: meniscus, angular or ingot shapes; nowadays they are even made into flowers, birds, fish and insects, more like arts and crafts than pure food. The Dumpling Banquet in Xi'an is highly recommended to enjoy the art of dumplings. At the Tang Dynasty Palace (Tang Yue Gong) and Shaanxi Song & Dance Theater in Xi'an, you can not only enjoy the dumpling dinner, but also are able to watch the Tang Dynasty Music and Dance Show. Join a tour with dumplings dinner arranged by TravelChinaGuide.com! Boil water and then put the dumplings in. Stir in case of sticking. Cover the wok and add water when it boils again. Add water for 3-4 times till the dumplings are well cooked. The whole boiling process usually lasts 5-6min. Combine soy sauce, vinegar, sesame oil and red chili oil. The dipping sauce is simple ready. Pick out some in a bowl or on a plate. Dip in seasoning sauce and have a taste. 1. Green onion: Trim a small section of green onion. Clean and cut it into small pieces. 2. Garlic: Prepare 3-5 cloves of garlic and smash them. Add in the chopped green onion, garlic, salt, sugar, red chili oil, soy sauce, vinegar and dried shrimps, according to your personal. Pour some soup in and stir to mix them. Put in dumplings. Note: If adding some coriander pieces into the soup dumplings, it can be more delicious. If interested, it is also suggested to add some white sesame. Now the soup dumplings are ready. The color is bright and the flavor is perfect. In addition to boiling, the dumplings can be steamed or fried. 1) Steamed dumplings: Lay out in a steamer. Steam for 30-40min and serve on a fine plate. Dip in the sauce and enjoy. 2) Fried dumplings: Place a wok over high heat until hot. Add some cooking oil. Turn to lower heat. Add in the dumplings one by one. Then add some water until they are half immersed. Cover the wok and heat on medium heat for 1-2min. Remove the cover and turn them over. Add some water and heat for another 3-5min. Pan fried dumplings (pot stickers) are also worth a try if you like fried food. Ms. Anika and Ms. Annemieke from the Netherlands, Mr. John and Ms. Rose from Canada, and Mr. Kevin from Ireland together enjoyed a different home-cooked meal in a typical family in Xi'an when they took part in our family visit tour. They said their favorite part was learning to make dumplings with the host, and they also appreciated the host's warmness, kindness and attentiveness a lot. Mr. Shaun & Mr. Alex from Australia joined our family cooking class especially offered for foreigners who are interested in learning to cook Chinese food during their China travel organized by us. They just learned to cook Chinese Dumplings, Sliced Beef in Hot Chili Oil & Eggplant in Sichuan Style from the friendly hostess and shared the dishes made by their own hand with the family finally. Ms. Bobby & Mr. Dominic from Australia had a special tour of TravelChinaGuide in Xi'an, during which they paid a visit to a local family and learned to cook dumplings on site. Ms. Bobby said that it was the highlight of their China tour.